All aboard! 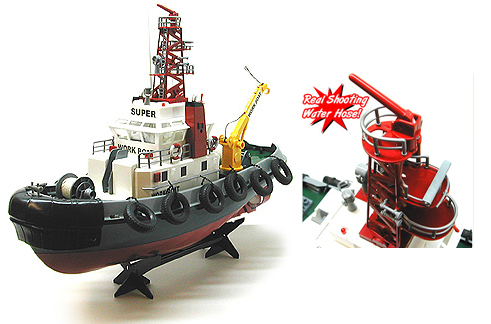 Time for some water action with this great RC Tugboat. It is sure you busy all day.This is loads of fun! forward-left-right backward-left-right-stop and also squirt the water using the controller. 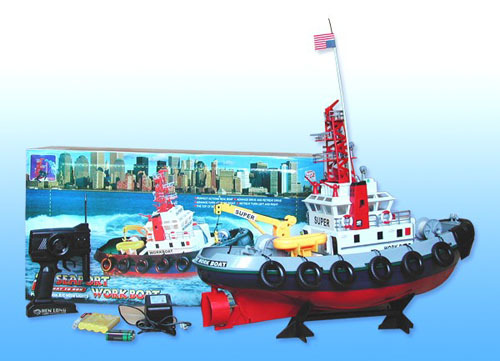 The tugboat has a working light and a crane for the life boat! 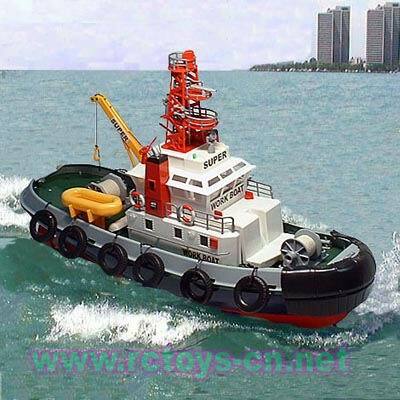 This tugboat is very detailed and realistic. Dimensions : 60L x 23W x 45H cm. Meget naturtro Tau-BÃ¥t, som spruter vann. KjÃ¸retid : 30 - 40 min. Ladetid : ca. 1 - 2 timer. Robuste konstruksjonen i ABS plast & metall. Vann-Kanon, fungerene Kran og Lys foran. Forrover, Bakover, HÃ¸yre, Venstre, Start, Stopp, Sprute vann. MÃ¥l : (L) 60 x (B) 23 x (H) 45 cm.